It all started on a weekend. As a first time mom, I had been anxious and nervous about labor. Will I know when I am in actual labor? Will my water break at an inconvenient time and place? Will everything be ok with baby? Will I be pregnant forever? I tried to push those intrusive thoughts away as the weekend progressed. My estimated date of delivery was on Thursday and I was sure I was going to be very late. I had started to get period-like cramps that weekend and it kept happening more and more as Sunday came to an end. I figured it must be my body practicing. Monday morning rolls around and the morning is pretty cheerful, I hang out with my husband before he has to head for work in the afternoon and his work already knows that it’s any day now. By Noon I told him he might have to call out. “Am I being overly sensitive?” I thought. I couldn’t possibly be going into labor. By three o’clock I called my midwife Mairi (I had been timing my contractions on and off the whole morning as I hung out with my husband). The period-like cramps were getting more frequent and starting to be more uncomfortable. I was told to keep doing what I was doing and to call if they got closer together, and she would call and check up on me later if I hadn’t given her a ring. A couple of hours later I called her back, “I think they are getting closer together”. If this isn’t labor and it’s just fake I will feel really silly, I thought. Mairi came over and checked me and the baby, and it seemed like labor was starting. YES! I will have my baby soon! The excitement gave me courage and strength. I felt truly alive and powerful. That was a constant (for the most part) in my mind throughout labor. I am finally going to meet my baby boy! The boy who I have grown inside of me for 9 months, who I have felt hick-up and kick, the boy my husband and I have gushed over ever since that positive on the pregnancy test. The child I have dreamed about meeting ever since I realized I wanted children. After the first visit with the first midwife, things became a bit fuzzy for me externally. At some point my other two midwives (Kathy and Katie) came to see and be with me, the laboring tub was set up (and I heard kind of flooded), there was no air conditioning yet in my condominium so I was in my birthday suit going through the contractions one by one. 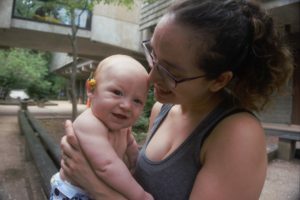 My husband had yet to get parking passes for the midwives so there was the parking situation that needed to be taken care of, but everyone around me was dealing with all that and I was in my own world. Being one with my body, trying to hear what my body needed in order to bring him into this world. Then the 24-hour mark hit. I was getting in and out of the tub, going to my bed, doing stairs, getting into weird positions my midwives were telling me to get to. “If you need rest we can go to the hospital” I was told. I looked at my husband, unsure If I could do it. I have always wanted a home birth. Always. It was incredibly important for me to bring my child into this world surrounded by peace and love. I work at the hospital, one of the major delivery hospitals in the area, and I knew It just wouldn’t be the same there. “Everything looks great with the baby and you, it’s not necessary and we can still keep going. But if you need to rest know its ok to go”. Everything is OK with him and me? My husband kissed my head and said, “Babe, you are so strong. I am so proud of you. You can do this”. I am staying. Tuesday comes and it goes. I can’t labor forever right? At some point he will make an appearance, right? My husband was incredible. I kept urging him to sleep and he kept urging me to eat. The midwives were the perfect balance of being there as support, but not being overwhelmingly there. Resting in the tub was incredible, and as I went through transition I had a moment of not feeling like I could do it. I looked up at my husband who was holding my hand and yelled at him “IM GOING TO THE HOSPITAL I DON’T CARE” …at least, that’s what I said inside my head. Apparently, what came out of my mouth was a meek “going to the hospital wouldn’t be the worst thing in the world…” As he looked at me completely confused, the transition passed and instant relief overcame me. I smiled the biggest smile and said WE ARE MEETING HIM SOON! My water had broken and it was almost time for the pushing phase to begin. After spending some time pushing on the bed in the guest room, I eventually settled in my living room squatting to push for hours. I was determined. With a lot of help from my wonderful midwives who were cheering me on, his head was born and instant tears ran down my husband’s face. Then his body was born and after 44 hours of active labor (with four hours of pushing) we finally got to hold our son. Our amazingly perfect son. I could not have asked for a better team. The midwives were incredible before, during, and after labor. They helped me shower, they made sure my baby boy was 100 percent and were readily available whenever I needed them. You can truly see how much they love what they do and the mothers and babies that they serve.